Watch out for personal pronouns! We recently created the 25 second video below to promote our business online. We posted it on our Facebook Business Page: https://www.facebook.com/inforestcom/. Thank you for reaching out to the Facebook Advertisement Support Team. My name is N****e and I see you require some assistance because you can’t boost your post. I understand our policies can be confusing. I’d be more than happy to look at your post and see what I can help you with. 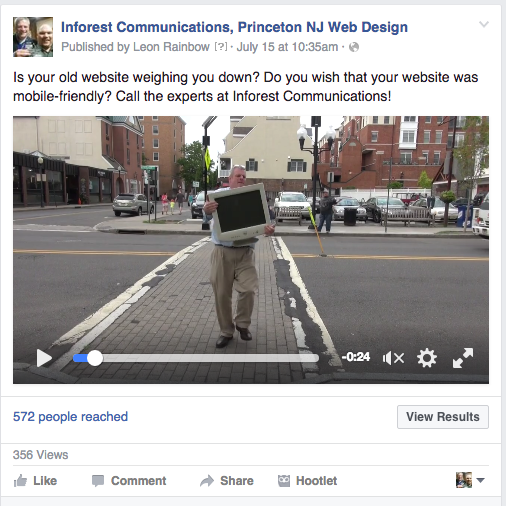 I looked at your Facebook Page – https://www.facebook.com/inforestcom/ and was able to see a video that you had posted. I have attached a screen-shot. The reason you were unable to boost your post is because of the words “you” and “your”. It falls in our policy of Referring to people’s personal attributes. Using “you” and “your” in your ads maybe directive toward users and that is why the ad was unable to boost. I would recommend creating a new post with different text and boosting that post instead. Thank you for contacting Facebook! The “person” at Facebook couldn’t have read our post because if he did he would have known that “you and your” in this case referred to a website. Our intuition says that Facebook uses a Keywords algorithm and no matter what context it is used in that if you use the words “you” or “your” in a Facebook ad it will get flagged. Is your old website weighing you down? Do you wish that your website was mobile-friendly? Call the experts at Inforest Communications!